On GovTribe, a Contract Award contains the award information and obligations for every federal contract or contracting vehicle. We mine information about federal contract awards and obligations from FPDS.gov so that we are always synced with the definitive federal source. 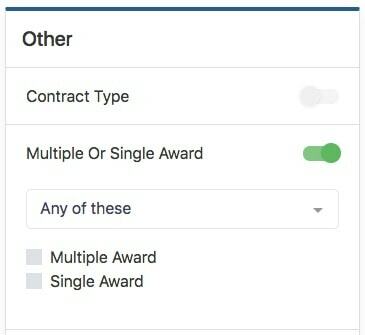 Contract Award information is searchable via three separate search pages on GovTribe, sorted under the Awards section of the navigation menu. Contract Award data is organized into multiple contract types by the government that GovTribe has organized into a hierarchical structure. When looking at a details page for a Federal Contract Award, Federal Contract IDV, or Federal Contract Vehicle you'll sometimes see this hierarchy represented at the top of the page in chevron form. It looks something like this from the perspective of the Federal Contract Award level. These are both in-context representations of the larger Federal Contract Award Hierarchy that can be fully represented by the chart below. Note that the three "levels" of the hierarchy coincide with the three search pages available to you on GovTribe. Though the federal government has about a dozen different contract designations, there are really only two major “types” against which money is obligated. Direct Contract Awards and Task Order Awards. Direct Contract Awards are those contracts that are awarded once, to a single vendor, and without the use of a pre-existing parent contract or vehicle. Direct Contract Awards exist only at the bottom, “Award” level of the contract award hierarchy structure. This means that contract ceiling, period of performance, and all other contract attributes are established through the same contract entity against which funds are obligated. Basically, these are the simplest kinds of contracts to track and evaluate because all of the relevant information is in one place. Definitive Contracts – Typically these are competitively awarded (sometimes sole-sourced) contracts for non-commoditized products and services. Purchase Orders – These are usually awards through simplified acquisition processes for commoditized products and services. They are often sole-source awards, but they can also be competitive. Task Order Awards are contracts that are awarded to a single vendor, but the award occurs under an existing contract (or IDV) that was previously awarded to that vendor. Task Order Awards have their own contract ceiling and period of performance. The parent (IDV) level also has a ceiling and period of performance, but it is usually different than that of the Task Order Award. Further, all the obligation activity happens here, at the Task Order level. Obligations do not occur at the parent (IDV) level, as will be explained in the next section. Delivery Orders – These are the task orders awarded under Federal Supply Schedule IDVs, Government Wide Acquisition Contract IDVs, and Indefinite Delivery Contract IDVs. BPA Calls – These function exactly like Delivery Orders but they occur under Blanket Purchase Agreement IDVs only. Above the award level is the Indefinite Delivery Vehicle (IDV) level. There are several types of IDVs, but they work pretty much the same way. Each IDV contract is awarded to a single vendor, and that vendor can be issued Delivery Orders or BPA calls under that IDV. Several important properties exist at the IDV level like period of performance for the IDV (which may be longer than any individual Delivery Order or BPA Call awarded under it), and the aggregate ceiling for all awards issued under it. Obligations do not occur at this level, but GovTribe does provide an aggregation of child task order obligations for every IDV. Note that, as depicted in the diagram, BPA IDVs can be awarded directly through some sort of open competition, or through limited competition under a Federal Supply Schedule. When a BPA IDV is awarded under a FSS, GovTribe provides the entire chain of ancestors so you can trace a BPA Call back up to the BPA IDV, and again to the FSS IDV. Sometimes existing above the Federal Contract IDV Level are Federal Contract Vehicles. Federal Contract Vehicles (sometimes referred to as Master Vehicles or Multiple Award Vehicles) are multiple award contracting vehicles through which the government may award Task Orders through the multiple Federal Contract IDVs that exist beneath them. Not all Federal Contract IDVs have a parent Contract Vehicle. FSS IDVs and GWAC IDVs always fall underneath a Master Vehicle, however IDC IDVs and BPA IDVs can also be single-award. That is, only a single vendor was the winner of a procurement process that resulted in an indefinite delivery contract or blanket purchase agreement. 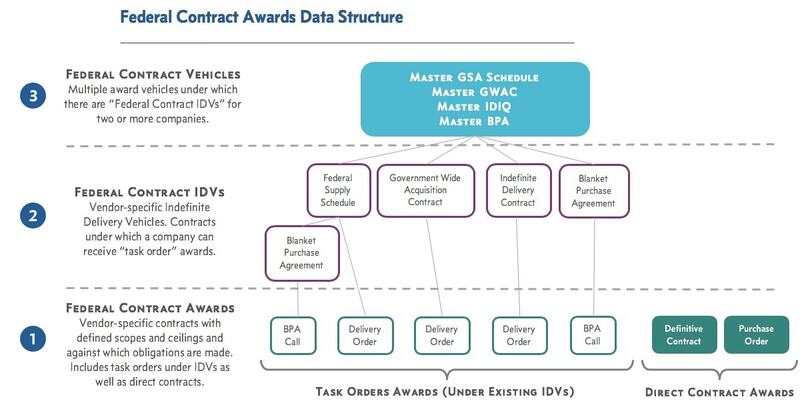 For those single-award IDVs GovTribe still consolidates the child Task Order Awards, but there is no parent contract vehicle in the hierarchy. The details page for a Contract IDV will indicate whether it is was part of a single- or multiple-award procurement. It is also obvious from the chevron graphic at the top of the detail page for any Contract IDV whether a parent Contract Vehicle exists. Further, GovTribe also allows you to filter by this trait on the Federal Contract IDV search page. 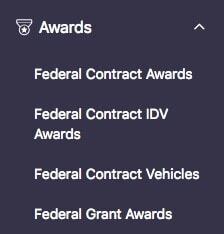 For those IDVs that are multiple award, GovTribe creates the Federal Contract Vehicle Level Above the Federal Contract IDV Level. Federal Contract Vehicles exist conceptually for the government, but they do not exist in the government spending data natively. Further, the government tends to conflate terminology between the Indefinite Delivery Vehicle (IDV) Level and (what we call) the Federal Contract Vehicle (or Master Vehicle). For example, they use the term GWAC to refer to both the vendor-specific GWAC IDV contract and the parent multiple award vehicle under which 20 vendors received IDV contracts. On GovTribe, we distinguish between Master GWAC and GWAC IDV, using those terms, for each type of Master Vehicle and IDV. Federal Contract Vehicles are almost always awarded to multiple vendors, and the children of Vehicles are always one of the Federal Contract IDV types described in the previous section. Federal Contract Vehicles have a kick-off date, a completion date, and a shared award ceiling. GovTribe’s Vehicle pages also include roll-ups of all obligations for all Task Orders issued under each of the child Federal Contract IDVs. Master GSA Schedule – Parent to FSS IDVs. Master GWAC – Parent to GWAC IDVs. Master IDIQ – Parent to multiple award IDC IDVs. Master BPA – Parent to multiple award BPA IDVs.